The weight, bubble structure, and interior hollowing prove beyond doubt that this bottle was carved from a solid block of glass. The hollowing, while formally excellent, leaves a relatively thick wall and stops well short of the foot. Double bottles must have been a quite early development in snuff-bottle production, and it cannot have taken the Chinese long to grasp the potential of multiplying the containers. 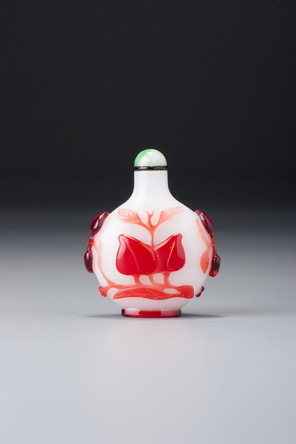 Double bottles in other materials are datable to the eighteenth century; this form was a standard of imperial moulded-porcelain production of the Jiaqing period. The formal integrity here is somewhat eccentric. 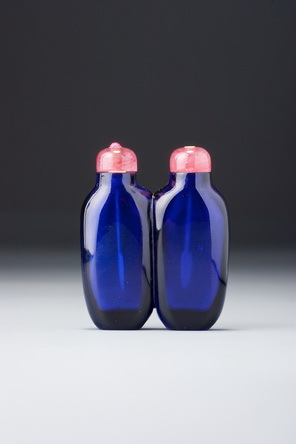 The two sides of each flask are of different profiles, with a higher, less sloping shoulder where the two meet in the middle, and a sloping shoulder on the other side. The two outer shoulders do not precisely match each other, nor are the two flasks of the same width. Looking at the foot, or from the bird’s-eyes view, it is also apparent that, rather than being aligned, the bottles are very slightly offset. This seems strange when the hollowing is accomplished with such confidence and skill, but is unlikely to have been intentional. Fortunately, the lovely colour and rarity of the form more than compensate for this minor peccadillo, and it is a relief from time to time to find an item in the Bloch Collection in relation to which we can, for a brief moment, lay aside our superlatives.